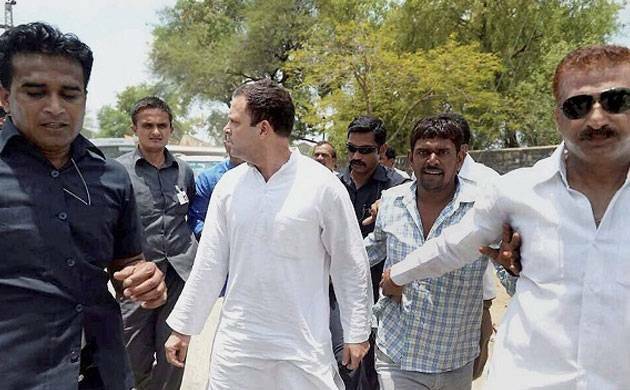 After facing detention by police earlier on Thursday, Congress vice president Rahul Gandhi has been allowed by the administration to meet the families of farmers killed in Mandsaur. “After a long struggle, the administration has finally ageed to allow Rahul Gandhi to meet the families of those who were killed in police firing,” former Congress MP Meenakshi Natarajan told reporters outside the guesthouse where scores of Congress leaders and workers were being kept. “We will try and meet them near the Rajasthan-Madhya Pradesh border,” she said. As crowds swelled outside the guesthouse of a cement company where the Congress members were taken, amongst those waiting outside the gates were the families of some of the five killed in the firing in Mandsaur on Tuesday. Gandhi was detained when he was trying to go to Mandsaur, ground zero of the farmer protests, from Rajasthan. Along with him are leaders like Digvijay Singh, Kamal Nath and Sachin Pilot.